Well done to all of you for such a fantastic effort during the SATs week. We were all very proud of how hard you all worked and how seriously you took the exams. Now that SATs are over with, we will spend the rest of this term focusing mainly on our writing. This will include reading our new class novel (Kensuke’s Kingdom) and also writing in Topic and Science. Welcome to the summer term! This term we will have our SATs exams where we will be able to show off everything we have learnt. Please see the timetable below. Please remember to come to our breakfast club, which runs Monday to Thursday that week, at 8:15am. Remember to keep reading every night and to keep up the hard work! In addition to what we will do in class, after school booster sessions will start on the week beginning the 16th January. These will be on Monday, Wednesday and Thursday 3:15 - 4:15. Parents, you will all have received letters about this now so please make sure they are signed and brought back to me on Monday 9th January. We’ve had a very busy but exciting time over the last couple of weeks so a big well done to Year 6 for coping with all the madness. It was lovely to see so many parents during the parent’s evening and I look forward to keeping you up to date with your child’s progress next term. 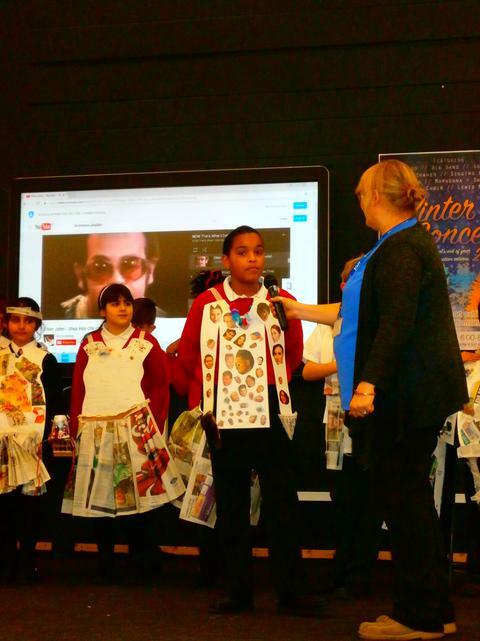 As you will have seen in the newsletter last week, six of our writers were shortlisted to attend an award ceremony as part of The Voice newspaper’s Black History Month writing competition. It was a fantastic experience for the children to write with a purpose and to have their efforts recognised. Well done! 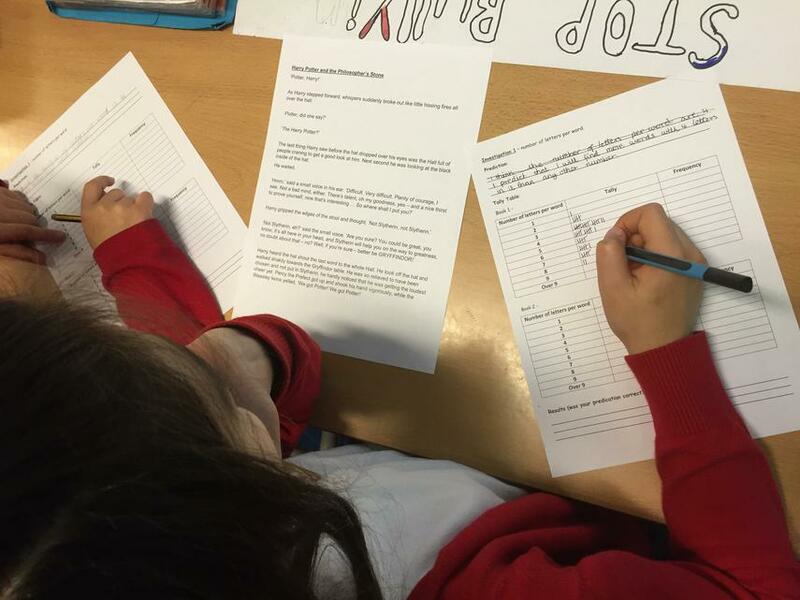 As part of Black History Month, Year 6 wrote persuasive essays to convince others about why we think that Ruby Bridges is a modern day hero. These were then sent to The Voice newspaper as part of their annual writing competition. I am pleased to announce that six children from Sequoia class have had their writing shortlisted and will be attending the Houses of Parliament on Thursday 8th December to attend the award presentation. It is a fantastic achievement to have so many children in one class to be shortlisted. Well done! 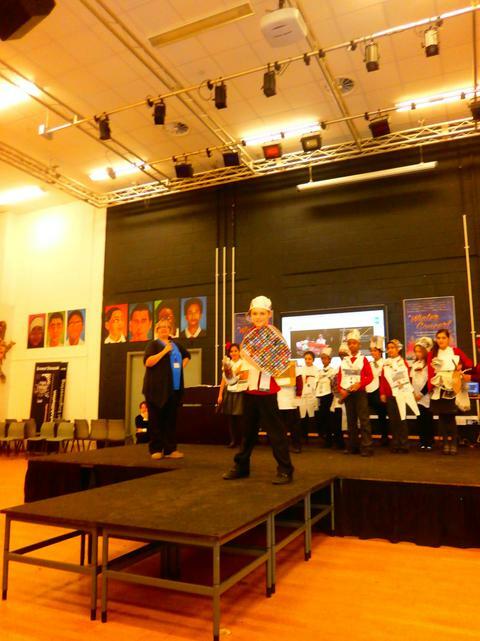 On Friday 2nd December 2016, sixteen children from year 5 & 6 got the opportunity to participate in an Eco- warriors Day at Acton High. 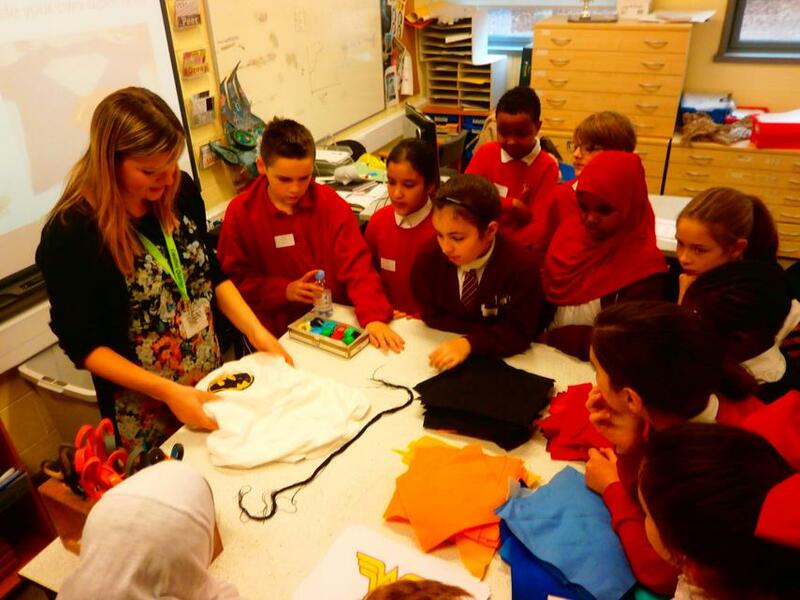 Our children got the chance to work with other students from Berrymede and John Perryn Primary as well as Year 10 Ambassadors from Acton High to design and make an item of clothing from recycled and reused materials. Specialist teachers from the Geography and Design and Technology departments supported the children throughout the day. 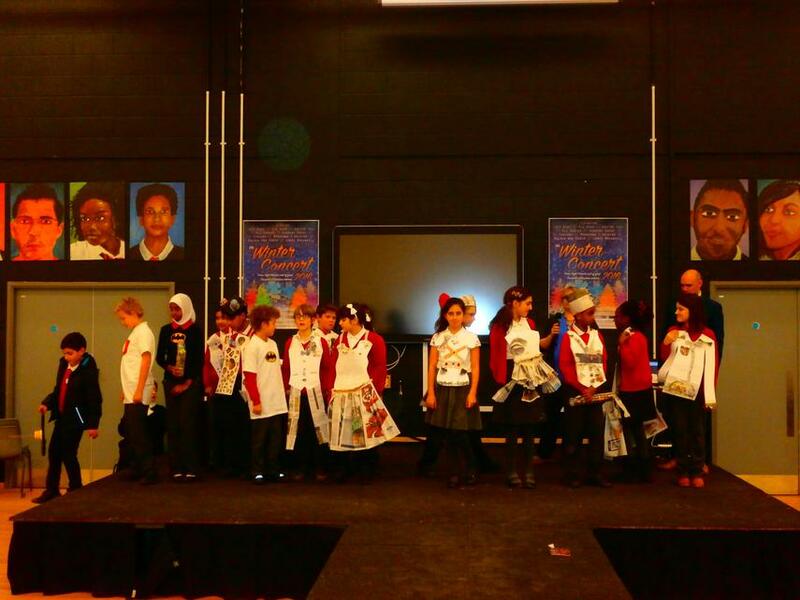 This culminated in a fashion show for parents and teachers at the end of the day. The students made some ingenious designs and expressed their creativity. It was an enjoyable day with lots of practical activities that kept the children engaged throughout. This week, the whole school celebrated World Maths Day. In Year 6, we combined our maths skills with our passion for reading. 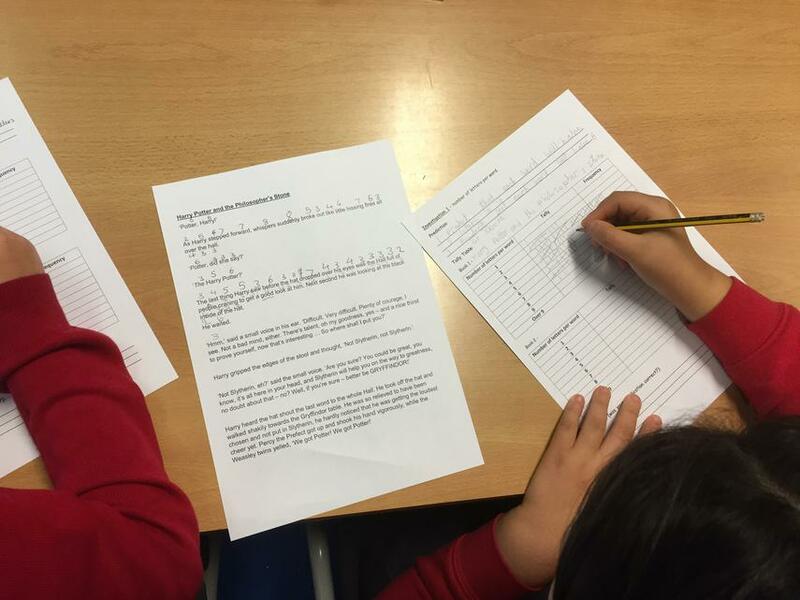 The children were giving two extracts (one from Harry Potter and the other from Charlie and the Chocolate Factory) and used their powers of estimation to predict the number of words per sentence and the number of letters most commonly found in each word. Using a tally chart, the children then had to either prove their predictions were correct or explain why they were incorrect. See below some pictures of the class hard at work! World Maths Day - combining our maths skills with our love of reading. Maths: Adding and subtracting mixed numbers. 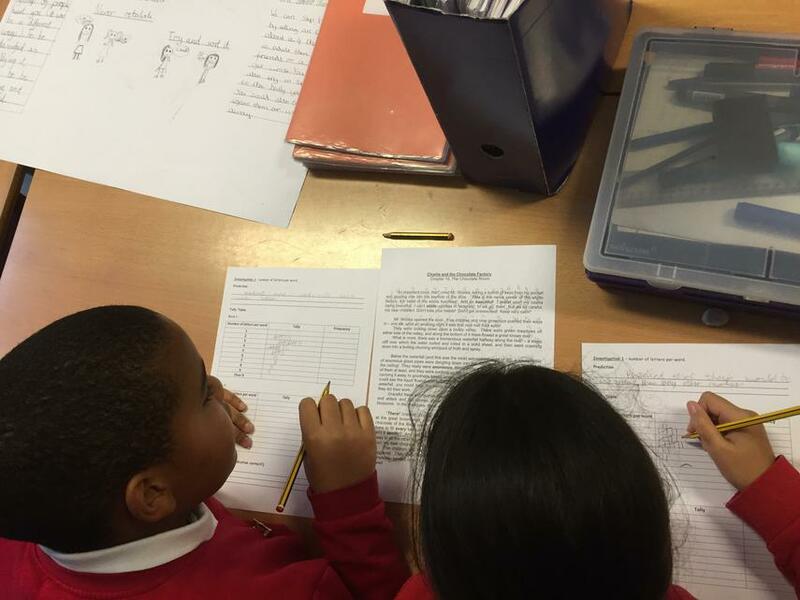 English – Next week we will be looking at our editing skills and improving a piece of writing we completed this week. This will be our writing based on the Ruby Bridges for Black History Month. How you can help your child at home...Get your child to read as much as they can over the weekend. Ask them if they recognise any features that the author has used and how they have used them. This will be a good way for your child to practise evaluating writing and considering how it could be improved. 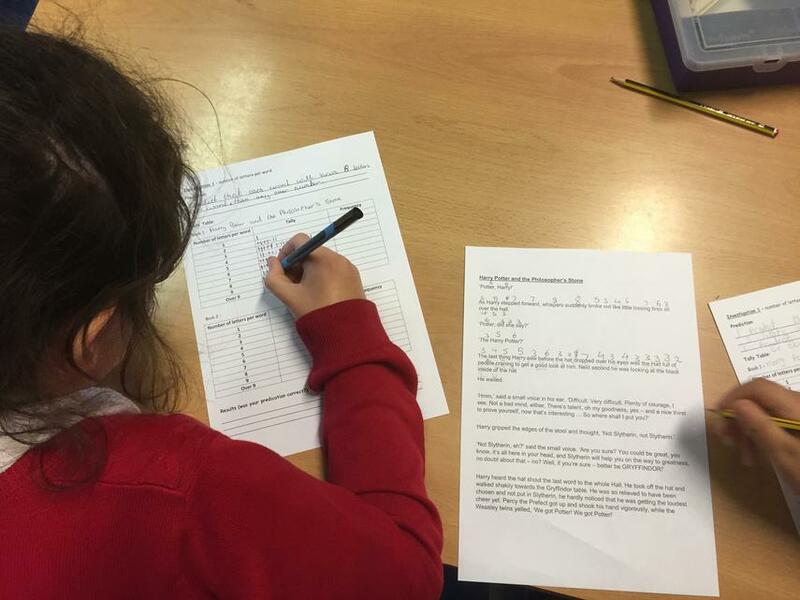 Maths – We will continue looking at division. We will be expanding our skills in this area by applying this to decimal numbers and word problems. How you can help your child at home...Get your child to practise their times tables daily. Their knowledge of these facts will help them greatly when it comes to solving division problems. Homework this week: Reading comprehension, SPaG (hyphens to avoid ambiguity), maths (division of decimal numbers) and spellings. English - This week our writing will be based around Black History Month. We will be writing a discussion text based around a famous black figure in history who we consider to be a hero/heroine. These essays will then be sent into The Voice newspaper as entries in their annual competition. How you can help your child at home...Allow and assist your child to research famous black people throughout history and read about their achievements and contributions. It would be great to see your child come into school with information they have researched. Maths - This week we are moving onto multiplication and division. We will be looking at the formal written methods of these two operations and applying them to real-life and context based questions. Reading comprehension - We are continuing to have our daily Reading Comprehension Skills lessons where we are looking at answering a wide range of different questions about texts. How you can help your child at home...As this is the first sessions of the day, please make sure your child is in school on time. Over the last week or two we have had a number of children coming in once the sessions have already begun. School opens at 8:45 and the register taken at 8:55. Quick note to parents of children away at Kingswood. We arrived safe and sound and the children are loving the tent huts they are sleeping in! They're currently making most of free time and using the fantastic facilities before dinner and evening sessions of climbing and bottle rockets. Photos and more updates to come soon. Mr. Cracknell and Miss Gobin. Well done everyone on a successful first full week back. We've certainly hit the ground running and I was very proud to see how well you handled the base line tests we gave you this week. Looking to next week, we will have a different timetable than usual due to the trip to Kingswood. For those of you going, make sure you get plenty of rest and don't leave the packing until the very last minute! Refer to your packing list for what you should bring with you (and don't let mum or dad do all the packing!). Parents - please don't send your child with a mobile phone. This week is about independence and we want to encourage the children to develop their resilience. I will have my mobile with me so, if there are any problems, I will be able to contact the school or yourselves. Your child should also bring no more than £10 cash with them which must be in a named wallet, purse or envelope. This is a perfect opportunity to talk to your children about being responsible with money and not to spend it all on the first day! To those who are staying - you are going to have a great week too! Your teacher this week will be Mr Jones (you may have seen him around the school already in Year 1). He will be taking English and Maths lessons in the mornings where you will be revising key skills and then the afternoons will be spent researching and writing about World War 2 bomb shelters. You will also have the chance to get creative by cracking out the paint and brushes to create more works of fabulous art to go on our class' display board in the corridor. Hello everyone and welcome to your Year 6 class page. This year promises to be full of new learning opportunities and I’m looking forward to us all working together to achieve the highest standards that we possibly can. You are a lovely class and I’m sure that we can have yet another successful year together! Parents, I’m also excited to be working with you again this year. I’d like to remind you that you can come and speak to me about any issues, concerns or worries…or even if you’re really happy about something! You can see our topic web below which will give you an idea of what your child will be learning about this half term. Maths – This week we will be looking at writing and ordering numbers in both words and numerals and rounding numbers to the nearest whole number and decimal place. You can help your child at home by…practising comparing numbers (from shopping receipts etc.) and saying large numbers in words. English – We will start exploring our text for this half term ‘Goodnight Mr Tom’ and reacquainting ourselves with some of the SPaG rules we learnt about last year. You can help your child at home by…Making sure your children are practising their reading and comprehension skills at home every night. It would also help if your child practises their writing by keeping a journal. They should think about all the different writing features we know (fronted adverbials, expanded noun phrases, figurative language for description and a wide range of punctuation). Science – This half term we will be learning about living things and their habitats, particularly how to categories different living things. You can help your child at home by…Discussing different animals and plants. How are they similar? How are they different? How could you organise them into groups?